It has hiking. It has camping. It has cows. Sunol Regional Wilderness even has a stony canyon called Little Yosemite, which is a little like Yosemite in the way a flower made of frosting is like a whole wedding cake. Hours: 7 a.m. to dusk all year; subject to closure during fire season. Pet fee: $2 per dog. Guide/service dogs free. Camping: Reservations required at all sites — call (888) 327-2757. Backpackers pay $5 per night, car campers pay $12. Driving directions: From Interstate 680, take the Sunol/Calaveras Road exit and take Calaveras Road (a right turn for north-bounders, a left for south-bounders) for a little more than four miles and turn left at Geary Road. Speaking of flowers, Sunol has bunches of wild ones sprouting this time of year. The poppies, lupines and shooting stars draw the biggest crowds to Sunol every spring. If you adore lovely things planted by the Unseen Hand of Nature, then this is the place to be. I don’t go to Sunol for the flowers. 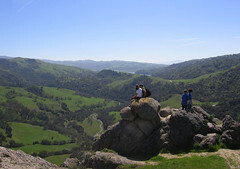 I go for the hills, the rocks and the vistas, which are among the best in the Bay Area. Every visit brings pointed reminders that the hills are frequently high and the trails are frequently steep. The park headquarters is on a valley floor, and almost everything worth seeing is up in the hills. Once you get up there, though, the views are magnificent. Sunol is tucked in a valley in the middle of the Diablo Range, and unlike in many of the parks ringing Silicon Valley, you can’t see much civilization from the heights. It’s just more hills, forests, valleys — you know, wilderness. Standard precautions: There’s more sun than shade at Sunol, so take sunscreen and a broad-brimmed hat. Poison oak is common, as are ticks. The trails can wear you out sooner than you might expect, so don’t take on more hill than you can handle. Trails can be muddy and poopy, depending on the season and the cattle wanderings. Easy: Take the mostly flat Camp Ohlone Road about a mile down to Little Yosemite; you’ll be tempted to crawl on the rocks in the Alameda Creek, which is gorgeous to look upon but a lot more dangerous than it appears. Scramble with care. Moderate: The Indian Joe Creek Trail tracks a creek bed for about a mile up to Cave Rocks, an impressive formation that climbers often practice on. Take a break there, then head up the trail for another half-mile or so to the next trail junction. From here you can make for the heights, hang around at this elevation or head back down. Check your map and your energy level, and go from there. Hard: Flag Hill Trail is the meanest in the park, but the view from Flag Hill is amazing. Eagle View Trail starts high on a ridge, tracks across a steep hillside and dives deep into a canyon — tricky footing at times, but it’s one of the prettiest trails at the park. Overnighters: Sunol’s backpacking camp is less than four miles from the park headquarters, close enough to create a base camp for weekend explorations and introduce your kids to the joys of backpacking. Campsites must be reserved a few months in advance for weekend outings during the April-May peak season. Thank you vert much for the dandy information about Sunol Park. I really needed this information and didn’t know where to go. And then I remembered how wonderful it is that the website helps us learn about anything and everything. That’s because so many fine and caring people share their thoughts and ideas. What a terrific world we live in. Life is good.